The right tools are crucial when it comes to growing a Bonsai tree. When you use the wrong tool for the task, you run the chances of damaging the tree and the tool itself. Plus, there’s also a chance that this will keep you from achieving your desired results. There’s plenty of cheap DIY tools but be sure you choose only good quality ones. Keep in mind that inferior grade tools tend to be heavier which can be tiresome for Bonsai practitioners. They also tend to break, bend, and rot quickly. Check out the essential Bonsai growing tools below if you’re a budding Bonsai enthusiast. While shaping your bonsai tree, there may be situations where you will want to bend the branches in a certain way. To do this, you will want to purchase a bonsai branch bending tool. This will allow you to bend the branches safely and ensure that you will be able to shape your bonsai tree as you want. This process is often used in conjunction with bonsai wire. A screw is used in the design of this branch bending tool. You can either increase or decrease the tension on the branch by tightening or loosening the screw. This is a simple design but it works very elegantly. It should be noted that these branch bending tools come in different sizes. You will find these tools in both small and large variants. Depending on the size of your bonsai tree, you may want to use one size over the other. Use your discretion, and pick out the best bonsai tree branch bending tool that will serve your purposes. Bonsai wire is used to help shape your bonsai tree. If you use the bonsai wire properly, then you can promote certain growth patterns. This can be used to force the bonsai to grow vertically, or to try to make it spread out more in a certain direction. It is a convenient tool to use when you want your bonsai tree to look a certain way. The process involves binding certain branches with this bonsai wire. It is actually pretty easy to use overall and shouldn’t take too much research for you to be able to use it properly. You will find bonsai wire just about anywhere that bonsai accessories are being sold. This will be the best way for you to alter the growth pattern of the bonsai tree, so it is likely that you will want to make use of it. You should be careful when using this bonsai wire, though. Caution is necessary in order to avoid harming the bonsai tree. If you are very measured with the way that you apply the bonsai wire, then you should be able to gently guide the bonsai tree to grow in the right pattern. This will be a good experience if you’re careful so just do a little research if you are unclear on how to best make use of this bonsai wire. Buying a hemp brush is going to allow you to clean off your bonsai tree as easily as possible. It is going to be gentle enough to where you won’t have to worry about harming your tree while you are cleaning it. You need to do this to clear away dead leaves and even to smooth the topsoil out some. You’ll be using this after your prune or trim your bonsai to get everything looking nice again. A good hemp brush should be fairly firm, but not overly hard. It will have enough rigidity to do its job, but will be soft enough to be safe to use on your tree. Sometimes you will hear a hemp brush being referred to as a hemp broom, as well. This is the same type of tool, so don’t let the different terms confuse you. This hemp brush is six and a half inches long. You can find them in other sizes if you would like it to be a different size. Sometimes the hemp brushes will look a little different from this, but they all provide the same function. Buy whichever hemp brush is most aesthetically pleasing to you, and you will be ready to clean up properly. You will need a tool at your disposal for when you need to cut the bonsai wire. This is going to be a crucial step, and you want it to be as simple as it can be. For this reason, you should purchase a specific bonsai wire cutter if you have the opportunity. Normal wire cutters can be used for this purpose, but it just won’t be as simple as it could be otherwise. Bonsai wire cutters differ from a traditional wire cutting tool. These bonsai wire cutters have a rounded head which makes it easier to get the tool where it needs to be. The wire is often placed in positions that wouldn’t be easy to reach with traditional wire cutters. Having the right tool for the job is imperative, so definitely seek out a set of bonsai wire cutters. Once you have what you need, you will be able to cut the bonsai wire without it being an issue. This will help you to continue to shape the bonsai tree as you need to. You’ll have good results when you buy a high-quality tool. This tool has been designed masterfully and will help you to have a great experience. These leaf trimmers are really small, but they work fantastically for what they are meant to do. It is only four inches long, but it is quite durable despite its diminutive size. The small size of this tool actually works to its benefit when it comes to bonsai tree trimming. You will be able to get this convenient tool right where it needs to be so that it can do its job. As you may have guessed by the name, you will be using this tool to trim leaves. It is specifically used for defoliating leaves and can also make important cuts. You’re going to need to get rid of certain leaves that stick out, and also unwanted buds. This is a sharp leaf trimmer that will make precision cuts with ease. This is a very affordable bonsai tree growing tool that you will need to own. Trimming leaves will be one of the most important parts of taking care of your bonsai trees. You will want to use a different tool for trimming leaves than you will for trimming branches. This is the perfect tool for cutting leaves, and you will enjoy making use of it. Concave branch cutters are another common tool that people use when they are growing bonsai trees. These concave branch cutters are used to make cuts on your bonsai tree very often. You’ll be using these on a regular basis, so this is going to be one of the tools that you will want to purchase right away when you’re getting into the hobby. This set of cutters is generally used to make cuts that are completely flush with the trunk, although it can be used for other cuts too. The concave branch cutter that is being showcased here is eight inches in length. This is a great size for a bonsai tool, as you don’t want your tools to be too large. You need to be able to use it in tight spaces, so this is going to work out really well. You shouldn’t have a problem getting these concave branch cutters where they need to be, and they will make precise cuts for you. This is a smooth tool to use that will work great for your bonsai efforts. The cuts that it makes to your bonsai tree will heal over very quickly. It’s important to get a smooth cut from a proper tool in order to promote the necessary healing in your plant. Purchase one of these so that you can start making cuts in the proper way today. Some people really like to use Japanese bonsai saws in order to trim their trees. These saws are the size as a knife and are really good at getting into tight spaces. If you need to make some cuts on your bonsai tree, you’ll be able to do so precisely when you own one of these saws. They’re very sharp and will make cuts easily so long as you know how to handle it. It is recommended to make cuts on branches that don’t have stubs. You’re going to be able to cut and remove branches without using too much force when you have this tool. The art of bonsai tree trimming is all about precision and delicacy. A tool that allows you to take a measured approach to cut something away is a very welcome addition to your arsenal. This saw here is nine and a half inches long. The blade is quite thin, and it was made right in Japan. If you want to own an authentic Japanese saw to use with your bonsai trees, then this is a great purchase. It will work excellently for you, and you’ll have a lot of control over making those precise cuts. Spherical knob cutters are another essential tool that you should buy if you want to take care of your bonsai tree as well as you possibly can. This tool is used to help promote rapid healing of cuts on the tree. You use this tool to remove knobs from the trucks and branches of the tree. With this tool, the process can be completed with very minimal scarring to the bonsai tree. You need to be very careful with bonsai trees if you are going to get the results that you want. You need to use the tools that are available to tend to the tree’s needs. Spherical knob cutters are just another important part of the process. There are going to be situations where you will need to remove the knobs, and you want to be able to do that as painlessly to the tree as possible. This is a truly professional bonsai tool and is made to stand up to regular use. Japanese craftsmen have created this tool with the specific purpose of bonsai tree knob cutting in mind. The blades are incredibly sharp, allowing you to make the cuts very smoothly. It will be a great tool for you to use and you’ll be happy to own it if you take bonsai trees seriously. A root rake is going to be essential when you are looking to transplant your bonsai tree. After a certain amount of time, your bonsai tree may wind up outgrowing its pot. In these situations, it is imperative that you purchase a new pot that will better fit its current size. There will be some difficulties that are associated with the transplanting process, though. In order to make things as simple as possible, you will want to have access to a root rake. A root rake is a convenient tool that will allow you to disentangle the roots of your bonsai tree. The roots may have grown in a funny way or become stuck on something. You can use the root rake to help set things straight before you do the transplant. 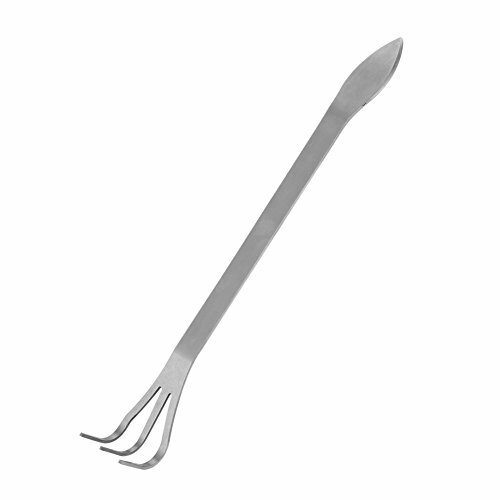 These root rakes can also be used to help aerate the soil and promote better growth. It’s good to aerate the soil from time to time, and this root rake is the perfect size for the job. You will find root rakes in larger sizes that are meant for gardening, but you need to seek out a root rake that is meant for bonsai trees. It’ll be easy to use it in the potting area of the bonsai tree, and you will get good results. 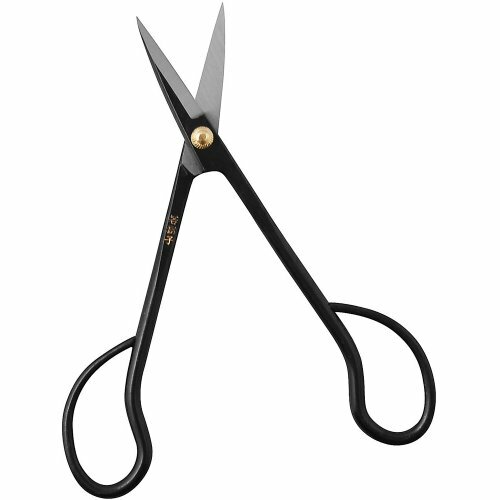 You shouldn’t have too tough of a time finding a good pair of traditional bonsai shears. These are going to be what you will want to do to make normal cuts on the plant. You’re going to be shaping these trees on a regular basis, so the type of shears that you purchase will be important. You will want to buy shears that are going to be sharp enough to make smooth cuts and that will be small enough to do intricate work when you need to. These traditional bonsai shears being shown off here are pretty much perfect for any bonsai tree. They are made out of durable titanium-coated stainless steel, so you will be able to use these for a very long time. Knowing that your purchases are going to stand the test of time is always a good feeling, so these are recommended shears for that reason. These blades are also angled, making it easier to approach narrow spaces and make your cuts. Shears like this are going to come in handy for more than just your bonsai trees as well. If you like to garden for reasons other than your bonsai tree hobby, then you’ll be able to use these shears effectively elsewhere. They can help you to trim plants and flowers with relative ease. Strong shears like this should be available to anyone who loves gardening. It is going to be necessary to trim the buds of your bonsai tree from time to time. You don’t want to use shears that are too big for this purpose. Ideally, you will want to use something that is small and won’t risk you harming other aspects of the plant while you make your cuts. A bud trimming shear is going to work perfectly for this task, so you should definitely seek one out. Trimming your bonsai tree is going to be one of the most important aspects of owning one of these plants. They will need to be trimmed consistently, and the whole purpose of bonsai is to enjoy helping the tree to take an ideal form. Bonsai tree enthusiasts often find the act of trimming the buds to be very enjoyable. You should have a good time with this and try to think of it as a relaxing hobby. Finding the right size of bud trimming shears may be difficult for you in certain circumstances. You will want to look for them at a specialized nursery or a hardware store. Once you find a good pair of bud trimming shears, you will be set to make your cuts. They will make it a lot easier to get the right angle and make cuts without causing harm to your bonsai tree. In order for your bonsai tree to grow strongly, you will want to give it the proper nutrients that it needs. Purchasing something like these bonsai fertilizer pellets is going to be a very good solution. You can add these fertilizer pellets into the soil with your bonsai tree and they will release slowly over time. It helps to promote the health of your bonsai tree and will keep it looking vibrant for many years to come. This product is pretty remarkable because it is able to provide sufficient nutrients for an average bonsai tree for up to five years. You could also choose to use this on multiple bonsai trees, rather than just a single one. You may need to buy the fertilizer pellets a bit more often if you decide to take this route, but the results will still be good. This is a good and cost-effective solution for taking care of your bonsai trees. Interestingly, these fertilizer pellets will also work well in other types of houseplants. 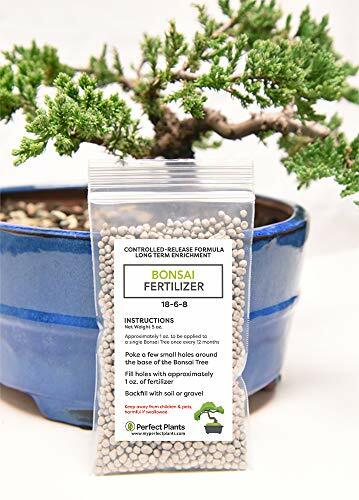 If you keep other plants in your house aside from bonsai trees, it might be worthwhile to keep this fertilizer around. It could wind up being a one-stop shop solution for your houseplant fertilizer needs. Either way, this is a good product that is going to prove useful to you. It’s crucial that you plant your bonsai trees in the right kind of soil. If you want your bonsai tree to be able to thrive, then you need to pay attention to all of the details. Taking the time to buy the right soil that is mixed properly for bonsai trees is going to make a huge difference. You will be able to keep your bonsai trees healthier overall, and they will look much nicer because of it. Luckily, getting bonsai tree soil is going to be a really simple task. You will be able to find this soil blend at many major nurseries and even some department stores. If you need to go online to get your bonsai tree supplies, then they will be readily available at online retailers. 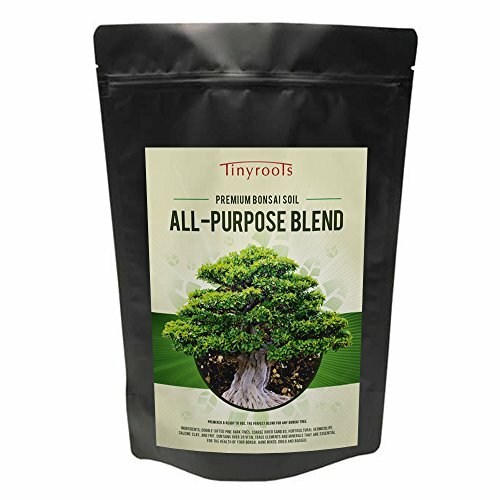 You just want to make sure that you are purchasing soil that is formulated with the right balance for your bonsai trees. This soil is completely natural and will work fantastically for all of your bonsai trees. It contains all of the vital minerals that your bonsai tree needs in order to remain healthy and continue to grow. Potting a bonsai tree is going to be as easy as it can possibly be when you have access to the right soil. Make a good decision and purchase the soil that you need today. You will also want to purchase a good bonsai tree pot that will help to promote the growth of the tree. You want to have a pot that is going to be able to drain properly while maintaining a good overall look. Bonsai tree pots shouldn’t be too deep as these are small trees with tiny roots. This pot here comes in several different sizes, so you will be able to choose which size is perfect for the bonsai that you are potting. Many bonsai tree pots are made out of an inexpensive plastic material. This isn’t the case with this bonsai pot, as it was created using mica. It’s a good material for this type of pot since you will be picking the tree up quite often. Clay pots can break when you fumble them, but this pot is going to be quite durable and should stand up to an accident or two in a worst-case scenario. These pots are an easy material to drill into if you have a need, as well. Some people like to drill holes into the pot in order to apply wire to certain places. This can be used to help train the branches or to promote a particular growth pattern. Buying a versatile and durable pot like this will definitely prove to be a worthwhile decision.